The Alumni Council is the primary representative body of Bowdoin's more than 20,000 alumni. The Council's mission is to build and strengthen lifelong relationships among alumni and between alumni and the College, and to provide a voice for alumni in the affairs of the College. It plays a key role in overseeing alumni programs such as Reunion, Homecoming, affinty programming, and regional events across the country and throughout the world. The Council also provides essential advice and input to the Alumni Relations Office on issues affecting alumni, and assists other Bowdoin offices including Admissions and Career Planning. 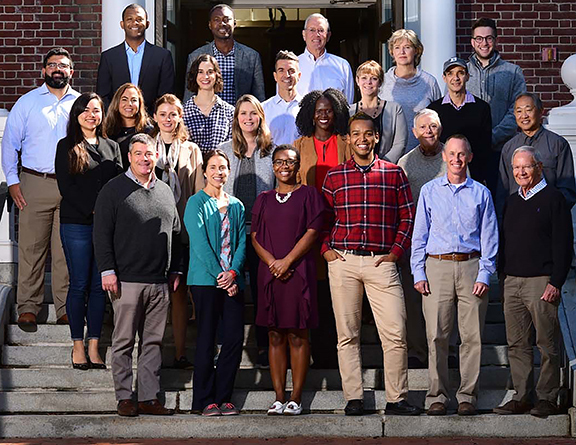 Alumni Council members are advisors, recruiters, fundraisers, communicators, and ambassadors for Bowdoin and help foster a spirit of loyalty and fellowship among alumni. The Alumni Council is comprised of up to 32 members, appointed to four-year terms in classes of no more than eight, selected by the Nominations Committee and approved by the full Council. The President of the College, ex officio. Members serve four-year terms. The National Chairs of BRAVO and Bowdoin Career Advisory Network, the Chair of the Fund Directors, and the faculty representative serve two-year terms. Student representatives hold their terms until graduation. Bowdoin's first Alumni Council consisted of twelve members. Elected by a general alumni ballot in 1914, the group convened at Commencement that year. Kenneth C.M. Sills (1901), then Dean of the College, played an influential role in the formation of the Council and called the initial meeting to order. This first Alumni Council immediately concerned itself with a revision of the Alumni Association Constitution, which it presented for adoption at the 1915 Commencement. The duties of the Alumni Council as prescribed by that revised Constitution are "to act as an executive committee of the Association and to represent the alumni in all instances where it may be necessary." Much of the Council's work has been accomplished over the years through regular or special committees. The Alumni Council has been instrumental in starting or promoting the Alumni Fund, the Placement Bureau (now Bowdoin Career Planning), a separate Admissions office, the Office of Alumni Secretary (now Alumni Relations), the alumni magazine, an alumni directory, and the Cram Alumni House. For more information about the Alumni Council, please refer to these frequently asked questions. We welcome nominations at any time for membership on the Alumni Council. For more information, contact Rodie Lloyd, Director of Alumni Relations, at rlloyd@bowdoin.edu or (207) 725-3963.